← Water Filtration Buckets For Houston! What do 25,000 rubber bands have to do with evangelism? One of the ways we share the gospel is through the use of what we call “The Wordless Bracelet”. We make packets containing colors that represent sin, purity, the blood of Christ, growth and heaven. Kids (and often adults too) make the bracelets and hear the gospel as they work. Then they are also able to use that bracelet to share the Good News with their friends and family as well! But making packets takes time. A lot of it. 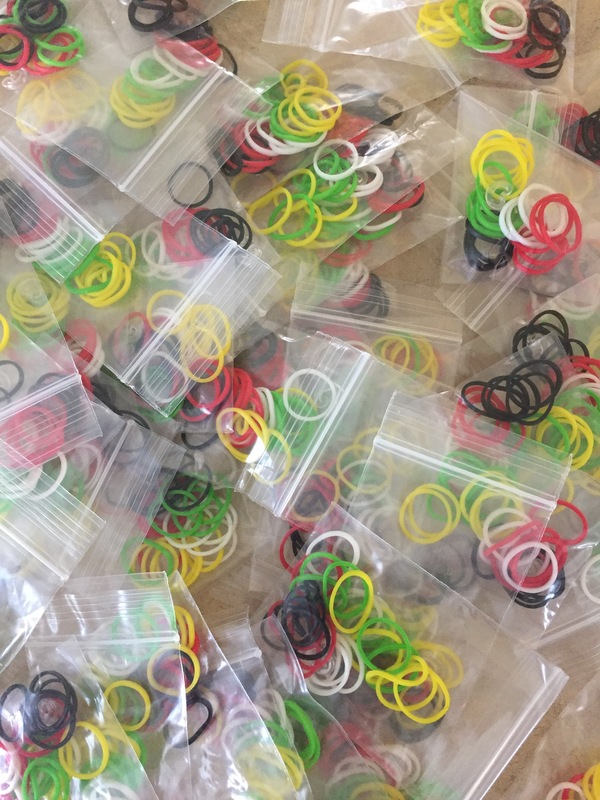 Imagine putting 25,000 individual rubber bands and 1,000 minuscule plastic clips into 1,000 tiny baggies… I don’t have to imagine. Sometimes I can’t even escape those rubber bands in my dreams! But Ponderosa Bible Teens came to our rescue! In just one hour they did what takes my family weeks! Thanks PBC Teens. You guys are the best! And we have 1,000 bracelet packets vacuum sealed and ready for Nicaragua!